Looking for CNC Manufacturing or Fabrication in Canada? Call us Today. Progress Machine has the technology to repair cone crusher equipment with the best efficiency and minimal time. We are capable of repairing, crusher cone head, crusher bonnet, crusher bonnet support, crusher wedge plate and crusher cone head bearing stump. Progress Machine Ltd., has a veneer product line for a direct drop in replacement parts for you COE Veneer Lathe. Our product line includes veneer chucks and roller bar drop in options. We also manufacture durable back-rolls to reduce your maintenance costs. 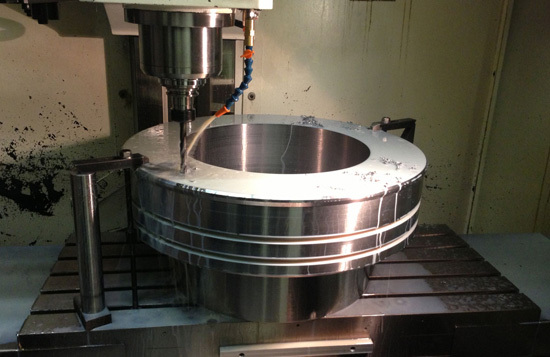 Progress Machine has CNC equipment capable of 5 axis machining. In our CNC machine shop, we can manufacture complex pieces using CAM software with high precision. Our Okuma B400W is capable of 5 axis turning and milling in one setup. Progress Machine has equipment for heavy machining for mining. The vertical lathe is capable of handling pieces up to 16 tons and 100 inches in diameter. The horizontal boring mill is capable of handling 100 inch pieces to be milled at our facility. Progress Machine Ltd is CNC and lathe services provider that has the right manufacturing and repair solutions for the industry. Whether you are looking for cone crusher repair, veneer products, our CNC machine shop has the right tools, equipment and milling machines to get the job done right. With over 15 years of experience, we have completed challenging projects with ease. Our expertise in the engineering services and CNC machining has helped our clients achieve efficiency and cut costs. Call Today for CNC, lathe and machining services In British Columbia & Alberta. Copyright © 2016 Progress Machine LTD. All Rights Reserved.